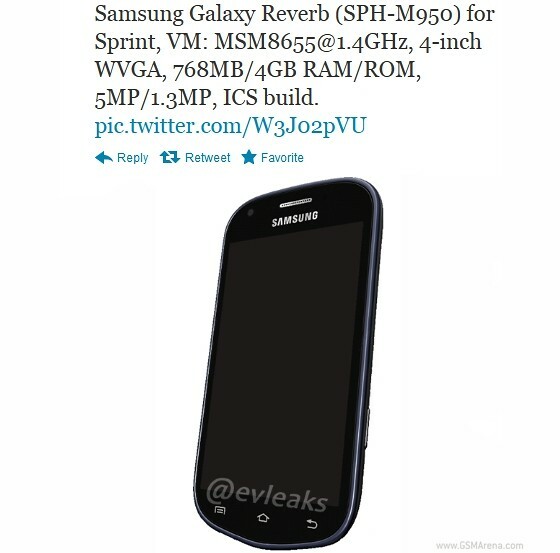 An image, which leaked on Twitter reveals a low-end Samsung Galaxy Reverb (SPH-M950), that's bound for a Sprint release. The image was leaked by the same source that brought us the Galaxy Jasper - a similar device bound for Verizon's LTE network. The post has been deleted from Twitter since, which leads us to believe that it was trustworthy. The Reverb offers a different capacitive button layout than the Jasper, but otherwise looks identical. Both should feature a 4" WVGA (400 x 800) screen, 768 MB worth of RAM and a 5 MP camera on the back with Ice Cream Sandwich on top. Under the hood is where things are different - the Reverb is reportedly powered by a single-core 1.4GHz processor, while the Jasper has a high-end dual-core Krait processor, clocked at 1.5 GHz. There's no word on eventual pricing or availability or if the Galaxy Reverb will offer LTE connectivity like the Galaxy Jasper. How many Galaxies is Samsung going to release this year. Phone spam to the max.